Everyone says it when they see the pyramids of Giza and the Sphinx. And so did President Obama. "It's awe-inspiring," he exclaimed as he gave those wonders of the world a final glance before bringing his one-day visit to Egypt to an end. "Alright, I guess we got to go back to work," he lamented as he gathered up his senior staff and headed to his motorcade. Giza was the last stop on the president's Egyptian drop-by. He was in-country for just over 9 hours, principally to deliver his speech about starting "a new beginning" in U.S. relations with the Muslim world. 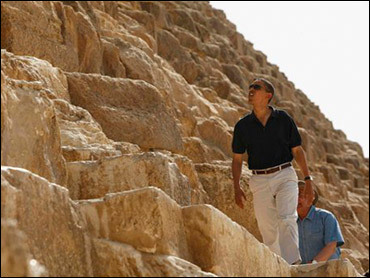 That was the centerpiece of his visit, but the drop-by the pyramids was the cultural highpoint. 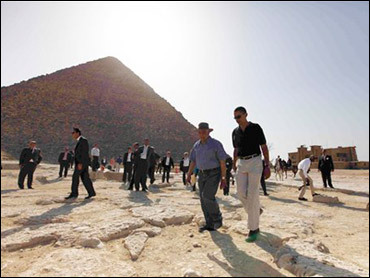 Serving as Mr. Obama's guide in Giza was Dr. Zahi Hawass, Secretary-General of Egypt's Supreme Council of Antiquities. He led the way in and around the pyramids and the Sphinx, including a visit to the Tomb of Qar, who Hawass described as a well-known priest, scholar and judge in ancient Egypt. On the wall were hieroglyphs of Qar, primitive images engraved in the stone. He was a thin man man with big ears. "That looks like me!" exclaimed President Obama. "Look at those ears." The president summoned to his top aides to take a look, and repeated his observation about the Qar hieroglyph. "Look, that's me," he told them. None of his senior staff was willing to disagree with the boss. Chief of Staff Rahm Emanuel smiled politely, if not knowingly. Actually, the graven image bore more of a resemblance to Mr. Spock of "Star Trek" fame. Wasn't there an episode where the crew of the Enterprise went back in time to the Egypt of the Pharoahs? If there wasn't, there should have been. 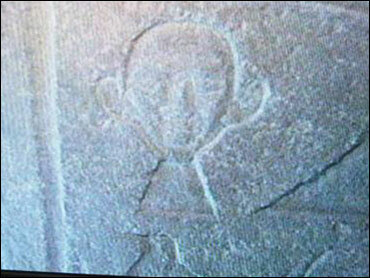 That might have explained a hieroglyph of Spock on the wall of an ancient tomb. Maybe President Obama went back in time. That'd be a good scenario for a pitch meeting in Hollywood. Out of the tomb and into the 100-degree heat of Giza, the president and his staff posed for a picture with the pyramids and the Sphinx in the background. Just across the street from them, another icon. Not of Egyptian culture, but American: a KFC restaurant. It didn't make it into the presidential photo. World Watch: Egyptians Hope Obama Words "Turn Into Reality"
Bob Schieffer: Obama's Speech "Remarkable"
Ari Fleischer: Obama Speech Too "Balanced"